People in Cornwall do not realise how big the problem of homelessness is in the county, according to a charity. There are no exact figures as to how many people are sleeping rough, but it is estimated up to 200 are considered homeless in Cornwall. 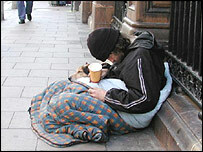 Homeless charity, the St Petroc's Society, says its an urban myth that some homeless people enjoy living on the streets. Many homeless people say they are still largely ignored by the public. Some people living in emergency hostels or on the streets say people are inclined to walk on the other side of the street or ignore them completely. A book of poetry called "Sleeping in the Rain" has been produced by the society and features the work of homeless men and women who have benefited from the charity. Steve Ellis, chief executive of the charity, says most homeless people will do anything to find shelter. He said: "There are very, very few people living on the streets who enjoy that kind of lifestyle. "Most of them would beg to actively get in somewhere and have somewhere that's warm and dry with the possibility of regular food. "There's also the thing about people's self-esteem and the fact that they can fit in to a community and contribute to it." In October, the Breadline Centre in Penzance was forced to close because of problems raising sufficient funds to keep its doors open and provide essential services.